Irrespective of the profession, when it comes to finding a suitable job, candidates need well written resumes to present themselves as the most suitable candidates in front of prospective employers. The document provides brief information about education, skills, and prior work experience candidates may possess. It is equally important for job seekers without making any discrimination on the basis of education, skills, experiences, and the nature of the job. It is necessary for individuals searching for senior positions or entry-level vacancies. People have several misconceptions about resume writing, about including and excluding things, and formatting. Such misconceptions can be easily rectified after observing templates available on the web. But the real battle starts when new college graduates or individuals lacking the relevant job experience are writing resumes to brand themselves to employers. Nearly all new graduates start complaining that their resumes fail to create the right impression and are unable to help them to get a job interview call. 90% of the applicants think they are not being selected due to possessing zero or limited experience. Although education and level of expertise matters to get good jobs with high status and to some extent, it is also a requirement for entry-level jobs. Obviously, no one will hire job seekers with inadequate and irrelevant education. Recent graduates might be experiencing the same situation. Despite possessing the relevant education and internship experiences, if grads are experiencing the same situation, they will actually need to recheck their resumes to know what they are missing. Here are a few simple resume writing tips recent graduates have to keep in mind while creating their resumes to get internships or entry-level jobs in their relevant career fields. Carefully, start by adding personal information like your full name, contact number, address, and an email address you check on a regular basis. Avoid misspelling these credentials, as they can be mistyped more frequently. The career objective section is crucially important, and it should be added just after the contact credentials. In addition to placing it correctly, the objective must be very concise, covering the key components like the position you are applying for, the profession, and the most relevant skills. It enables your resume to stand out among the hundreds and thousands of resumes an employer might be sifting through. Being recent graduates, the education section on their resumes is extremely important. Some candidates might not possess internship experience, and all they have are their degrees and certifications. Recruiters usually short-list candidates for entry-level and internship positions on the basis of their educational qualifications. Therefore, candidates must be very careful while adding and organizing educational information on their resumes. Start by adding the most recent degree and also mention the net GPA if it is three or more; don’t add the GPA if it is less than three. It’s better to mention the GPA of particular major if it is high enough. Don’t add unnecessary information about high school; instead, concentrate on current activities, work experiences, and accomplishments during college. Although recent graduates are not classifying themselves into professional groups, they shouldn’t hesitate to create professional profiles on any of the suitable websites like LinkedIn. Grads are in the process of starting careers as professionals and should not underestimate themselves. Adding their professional profile links or portfolio links, in case they have made them during or after college, will portray a positive image of graduates’ personalities. It reveals they are eager to become professionals, and possess an innate love for specific career fields. Don’t use first person or second person to describe yourself in a resume. Refrain using “I” or “me”. Also avoid using your name to talk about yourself in third person like “Anna is a fresh graduate” or “she is willing to join.” The best way to illustrate skills and accomplishments is using a few action verbs like created, developed, or managed under the heading of the department where someone might have worked. They give a natural tone to job seekers’ documents. Recruiters are well aware that candidates applying for entry-level jobs either don’t have work experience or that they lack the experience required to a vital job. After considering these simple tips and tricks, recent graduates will be able to write effective resumes to obtain desirable entry-level jobs according to their educational qualifications. 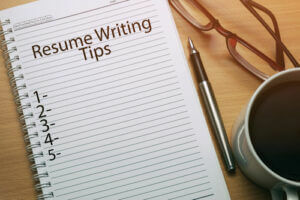 For more resume writing tips to benefit your job search, check out College Recruiter’s blog and follow us on Facebook, LinkedIn, YouTube, and Twitter.